﻿ Chapter 1: the Hand of "El caballero de la mano al pecho"
The hand of "El caballero de la mano al pecho"
In Madrid's Museo del Prado hangs the world's largest collection of El Greco's paintings. Among them, in a room alongside other portraits, hangs the painting known only as "El caballero de la mano al pecho"--the gentleman with his hand on his chest. The purpose of this study is to determine the meaning of the gesture used in the portrait of "El caballero de la mano al pecho." This essay is an iconographical analysis of the hand sign viewed from historical and religious perspectives. As in the analysis of the cultural anthropologist, the final conclusion can only be inferred from the material since the analysis deals with the art, the history, and the religions of centuries past, and because it deals with an artifact of symbolic communication--a hand gesture--as old as art, though forgotten today. 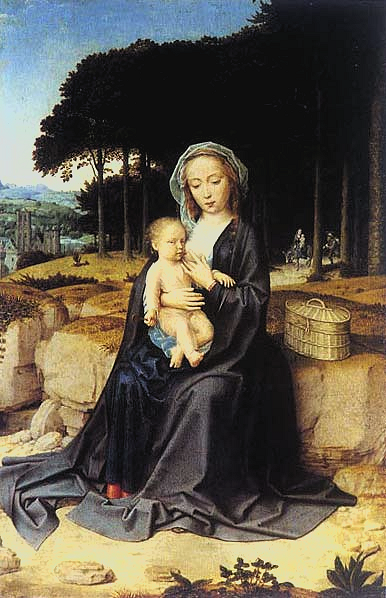 This study also seeks to establish the status of the gesture within the Christian economy of salvation and its iconology, linking the gesture to the breastfeeding of goddesses, then progressively to their ability to bestow eternal life through their milk, to the gradual evolution of the gesture away from the naked breast, and its migration to men for their use in seeking maternal salvation. Around the year 15781 in Toledo or Madrid, Spain, the painter Doménikos Theotokópoulos (δομηνικος θεοτοκοπουλος), originally from Crete, and known as "El Greco" (the Greek), created a painting that is now called "El caballero de la mano al pecho" -- "The man with his hand on his chest." The painting is a half-body portrait on a dark background of an unknown bearded Spanish gentleman dressed in basic black with white lace trim at his wrist and neck, adorned with a gold pendant and the gold hilt of a sword high up on his left side, with his right hand on his chest. There is a single peculiarity about this painting: the gesture of his right hand -- fingers splayed except for the third and fourth digits which are tight together. These two fingers are painted together in such a way that -- were it not so odd -- one would assume that they were physically joined. This peculiarity, his hand gesture, "ha hecho correr ríos de tinta"2 and begs for further investigation. By covering these three areas within a historical context we should be able to arrive at the meaning that lays behind the hand. However, since the gesture has already been practically introduced for its study in relation to the single painting in question and for the purposes of this paper, the order of Turner's methodology will be modified by reversing numbers (1) and (2). El Greco's personal history is important to the issue here. Doménikos Theotokópoulos was born around 1541 on the island of Crete which had been under Venetian control since the year 1204. At about the age of twenty, already a painter of religious icons, he left Crete to further his art studies in Venice where many of his Cretan compatriots dedicated themselves to painting the madonneri, becoming painters of the Madonna in imitation of St. Luke.7 We can safely assume, judging from his Orthodox cultural background and early paintings, that he was already quite adept at painting religious figures and icons. From Venice he moved to Rome (ca. 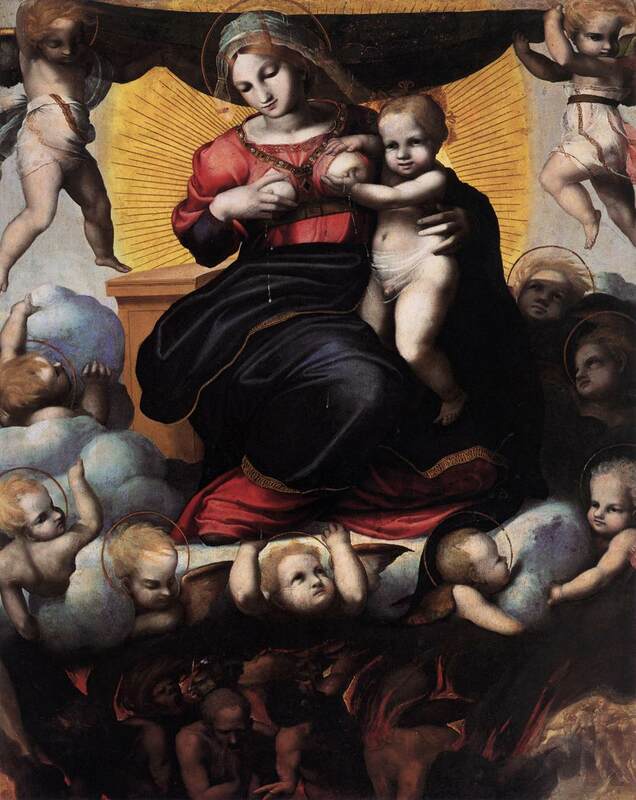 1570) where his painting style vastly improved, thanks to the influence of Italian masters such as Tiziano and Tintoretto. Because of the Italians' difficulty in pronouncing his Greek proper name, he came to be known simply as "Il Greco" -- the Greek. Leaving Rome and Italy for unknown (but dubious) reasons, Il Greco came to Madrid where the Italian definite article "Il" was changed to "El," hence "El Greco." It was in Spain in the latter half of the 16th century, during the reign of Felipe II (who raised Spain to its zenith in art, geo-political influence, and religious fervor), that El Greco developed into the greatest mannerist painter. He lived and painted in Toledo, the capital of Catholic Spain from 1085 to 1561, the See of the Spanish Roman Catholic Church, and the former religious center of Sepharda, Jewish Spain. Toledo was also the financial capital of the Empire in which the Jews thrived (in a relative sense) under the protection of the financially weak kings until 1492 when they were expelled en masse from Spain. El Greco himself was a Catholic -- Eastern Orthodox by birth and tradition, and Roman by necessity, if not by desire. It was the time of the Reformation and the Inquisition: the northern Mediterranean Catholic countries were at war with the other European powers that denied the authority of the Church, the leadership of the Pope, and the quasi-deification of the Blessed Virgin Mary. In this age El Greco painted his religion: Annunciations, the birth of Jesus, the Holy Family, Crucifixions, Resurrections, Ascensions, and literally hundreds of apostles and Christian saints. Very rarely did he ever stray to paint in the secular field, save for portraits and a few incidental commissions. Even these were touched with a religious mysticism, the kind exemplified by the two most famous Catholic mystics of the time, Teresa de Jesús and Juan de la Cruz. Difficulties in accepting the theory that the hand gesture may have been a covert sign of identification or a remnant gesture copied from Jewish ritual, used among the secret Jews (the crypto-Jews/false Christians, conversos, and marranos) of Spain, stem from the fact that no such sign is recorded or alluded to in any of the wealth of Sephardic and kabbalistic texts from this period. Art historians have dismissed Oppenhejm's thesis, calling his ideas "hipótesis sin fundamento, pero que forman parte de una conciencia general sobre la raíz oriental, antigua, de Theotocópuli. "9 A more caustic version of this denial is also offered: "El sefardita no dejó nada de su concepto de la vida ... ni artisticamente en el pueblo español ... ni en la poesía ni en el arte español. "10 Although Oppenhejm's thesis may be rejected on the lack of positive evidence that El Greco was Jewishor that his patrons were Jewish, or despite the fact that he lived in the judería (the old Jewish barrio of Toledo), there is more significant negative evidence indicating that the hand gesture is not Jewish. In only one instance has the gesture of the caballero been used in a specifically Jewish painting, and that in a twentieth-century drawing.11 Its absence in Hebrew literature and history is proof itself. Oppenhejm most likely confuses the specific finger positions in the gestures of the Amidah and the blessing. What he probably refers to historically is the rite of the Priestly Benediction (dukhenen),12 also called the Kohanic Blessing -- the ritual blessing prayed over the congregation by a member of the priestly caste of the Kohanim in which "the hands are held touching at the thumbs with the first two fingers of each hand separated from the other two, thus forming a sort of fan. "13 The blessing begins with the word "shalom" -- "peace," which itself begins with the hebrew letter shin, composed of three vertical strokes and one horizontal stroke below joining them: ˘ or ˘. The blessing is pronounced with each of the hands formed into a shin, touching forefingers and thumbs, second and third fingers joined, fourth and fifth fingers joined, with the arms raised over the head, traditionally covered by a shawl. This gesture has been inscribed on Jewish tombstones throughout Europe,14 used for centuries as "cosmic symbols,"15 and even in contemporary society as "an ancient matriarchal sign for strength and power. "16 The kohanic blessing has most recently been popularized by the extraterrestial humanoid character "Spock" in the American television series "Star Trek." Leonard Nimoy, the actor who developed and portrayed the half-Homo Sapien, half-Vulcan character 'Spock,' was raised an orthodox Jew. Nimoy states in his autobiography that he adopted the greeting, "Live long and prosper," and its accompanying one-handed "Vulcan salute," from the Kohanic blessing's shin, taken from his orthodox Jewish heritage.17 In the larger realm, there is no letter or religious gesture, Hebrew or otherwise, similar to the splayed hand in El Greco's painting. The caballero's stylized gesture is actually non-existent in the known Hebrew tradition of the 16th century, whereas the gesture of the Kohanic blessing existed for centuries prior to El Greco. Given the lack of graphic corroboration and the similarity of the Kohanic blessing, Oppenhejm's hypothesis should be discounted as a case of mistaken identity. ... But it was the hand that was prominent in the picture. Señor de las Cuevas asked, "The hand does seem strange, with the thumb bent outwards, the exaggerated length of the fingers; why the unnatural pose of the fingers tightly closed, while the other fingers are spread out? Nobody ever holds his hand against his chest in this manner." Greco was beginning to paint. "I should like Doña Jerónima [Señor de las Cuevas' daughter] to explain this." "I thought it was a sign of secret understanding?" "Speak up, daughter, you seem to know a lot of things your father has never heard before." Said Jerónima, "This gesture is recommended by Ignacio de Loyola in the first of the four notes of his 'Spiritual Exercises.' One hand is placed against the chest each time a sin is committed, and thus we symbolize that there is suffering in the heart." There has been no official response to this hypothesis in the academic literature regarding El Greco, yet this second theory is far more general and ambiguous in its language and application. It is, however, as wanting of proof as the first. There are four major problems to confront before accepting the Loyolan theory for this gesture. First, approximately thirty years separated the publication of the "Spiritual exercises," published by Iñigo de Oñaz y Loyola/Ignatius of Loyola, the founder of the Society of Jesus/ Jesuit order in 1548, and the painting of "El caballero de la mano al pecho," painted by Doménikos Theotokópoulos/El Greco around the year 1578. El Greco's library is still extant and does not contain a copy of Loyola's "Spiritual exercises," which would likely exist if indeed it exerted such a great influence on El Greco's work. Second is the fact that Loyola fails to specify the posture of the fingers in his book: it is simply to "place his hand upon his breast. "21 This same gesture as specified by the "Spiritual exercises" is referred to in the 1771 diary of the early American protestant minister, the Reverend Ezra Stiles, who described himself in the portrait as posed "in a Teaching Attitude, with the right hand on the Breast. "22 Loyola's "hand on the breast" is by far too general of a description to use in explaining the particular gesture used by El Greco. Thirdly, none of the above works quote the source in toto; all three leave off the final line of the paragraph in which Loyola further states that this gesture of penance can be done "even in the presence of many others without their perceiving what he is doing,"23 correlating with Jesus' commandment in Matthew 6:1, "Be careful not to do your 'acts of righteousness' before men, to be seen by them. If you do, you will have no reward from your Father in heaven. "24 It would seem that painting a gentleman in such a flagrant act of penitential piety would ill-behoove the "mystic" practitioner of the Exercises in his attempt at attaining spiritual salvation. Jesus' statement, with Loyola's later personal confirmation of the same pietistic principle, would seem to prohibit the outward display of the act of penance in a painting. 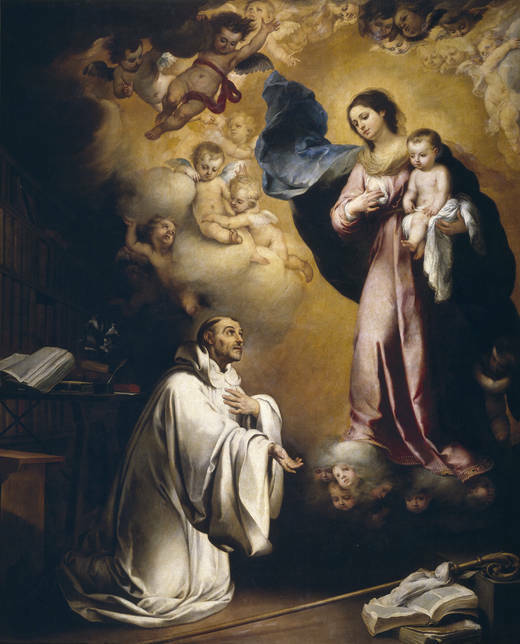 If the gesture was so defined and acknowledged by such a wide body of believers in Spain as the Jesuits, its public display would run counter to Loyola's dictates. It is thus more improbable that the caballero's gesture is that of Loyolan penance. And finally, the Jesuit foundation of the gesture of the caballero would most probably have a universal application within the artwork of El Greco that would carry the same theological sense or feeling throughout its usage. The painter, however, used the hand symbol in numerous paintings almost exclusively with Jesus, Mary, and the saints (see below). The caballero, a mortal man, however, was born a sinner and, by definition as a human being, remained a sinner throughout his life. In the Judeo-Christian tradition humanity sins, not God. In Christianity Jesus, being God himself incarnated, could not and did not sin, and Mary, the virgin Mother of God (Theotokos: God-bearer) is said to have been free from all sin (including original sin) herself. Thus, any hand sign used to symbolize suffering and regret of sin would not be properly used among the non-sinning deities. Whereas there are many symbols of godhood used among the mortal followers of the faith, the Christ Jesus never assumed the most basic human condition of sin. It could be argued that in the paintings of El Greco Jesus and Mary use the caballero's gesture in empathy for the sinning mortals. Both would then be communicating, in effect, that they also feel the pain that sin creates in the hearts of men and women--a rare phenomenon of deities empathizing with humankind's worst quality. Loyola's "hand" is by far too broad a category under which to cover the caballero's and others' distinctive gesture. Further speculations as to the meaning of the caballero's hand offer vaguer, more nebulous interpretations resulting in further and ultimate mystification rather than a set of ideas based on any coherent methodology. In this manner the gesture used by El Greco in his painting becomes trivialized and relegated to the status of an unknowable psychological factor, open to any and all interpretations. Because of the lack of evidence in this case, art historians have couched their speculations of the hand's symbolic meaning in arcane and metaphysical terms: "a sign of secret understanding,"25 "as if to affirm some fact of great importance, holding his heart as witness to some oath,"26 "indicates subjugation of the body to the will of Another,"27 "some ritual sign ...[of] a man surrendering and guarding his soul at the same time, this gesture of possession of himself and also of dialogue, ... a certain fashion of aristocracy,"28 "a picturesque recourse for chromatic contrasts expressing 'an exaltation of the I (ego),'"29 a "serene gesture of calm [that] denounces all the agitation of the interior life ... as if this were something that could be communicated with the hand,"30 "accentuates the spiritual meaning of the image [which] reflects the atmosphere of fanatical religious zeal in his [El Greco's] adopted country,"31--all ethereal and psychological attempts at an explanation, none of which offer any direction to a historical study of the gesture outside of the context of El Greco's paintings. 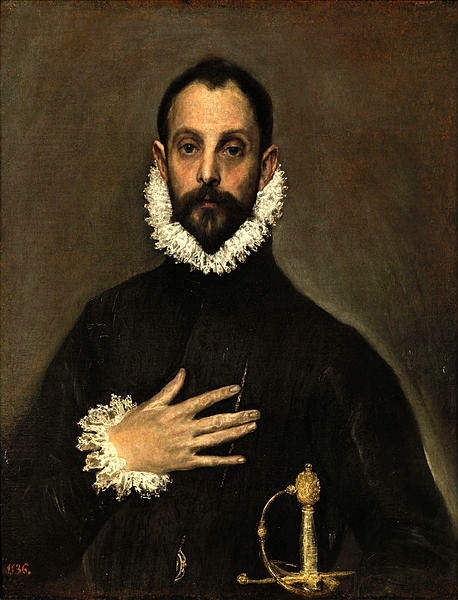 Having examined the "interpretations offered by specialists and laymen" for the reason and meaning of the hand in El Greco's painting of "El caballero de la mano al pecho," the hypotheses proposed are found to be wanting in substantiating evidence that would materially link the gesture with a culture or body of literature. The main problem lies in the art historian's narrow view of the phenomenon, which was limited to the single painting of El Greco. It is now time to examine the "external form and observable characteristics" in order to begin the examination of the gesture in a broader historical perspective. We can now acknowledge that the gesture of "El caballero de la mano al pecho" by El Greco cannot be analyzed within the hermetic restrictions of painting and painter: the fields of investigation must be broadened to examine the incidence and appearance of the gesture in other areas, from other times, from different cultures. The gentleman in "El caballero de la mano al pecho" is most often understood to be a normally developed human being. The apparent asymmetry of the caballero's sloping left shoulder, coupled with the location of his sword high up on his waist, might indicate an injury or a possible malformation of the shoulder and back. These two variances from the normal human phenotype have led Angulo Iñiguez to assert "that the man's left hand is missing and the left shoulder is much lower than the right due to a deformity at birth rather than to an injury sustained in battle. "32 Given this theory it may not be overly presumptuous to postulate that the same congenital deformity that may have caused the asymmetrical shoulders may also have been connected with a genetic deformation of the caballero's hand. From this possibility it is then a logical progression to inquire whether the hand itself may have been a physical anomaly. In medical terms the hand appears to be a perfect specimen of zygodactyly, the most common and mildest syndactylous malformation in which the third and fourth fingers are fused or webbed together. Syndactyly refers in general to the digital malformation in which fingers or toes grow together, joined by soft tissue33 with an incidence of approximately one per 3000 births in the male population.34 "Zygodactylism"--a word composed from the Greek roots zugon: 'yoke' or 'joining,' as in a "zygote" (a fertilized egg composed of ovum and sperm cells), and daktulos: 'digit,' as in finger or toe--refers to a form of syndactylism (sun-: 'with,' 'together') the digital malformation of the hand or foot caused by genetic mutation. This specific hand gesture has been identified as a distinct form of gesture found within Western art and should be given its own proper name to fit within the nomenclature of gestures. The previous introduction of the term "zygodactylism" offers us a more precise nom de plume for the gesture that will allow us to identify it specifically, apart from the general description of "the caballero's hand" or "the splayed hand." We shall from here on refer to the gesture portrayed in the painting "El caballero de la mano al pecho" by El Greco, i.e., the splayed hand with the third and fourth fingers joined together, as the "pseudo-zygodactylous gesture"--"pseudo-" for false, indicating that the gesture resembles zygodactylism but only superficially. For ease in reading the abbreviation "p/z" shall also be used; fingers also shall be referred to being numbered consecutively, beginning with the thumb as the first finger, index as second, and so on. Thus the classical p/z gesture of this study will be defined in full as: first finger (thumb) splayed outwards, second finger ('index') splayed, the third and fourth fingers (middle and 'ring') held tightly together, and the fifth finger ('little') splayed away from the fourth. Distance of the first two fingers from the joined third and fourth fingers is necessary for this definition, with some laxity (as we shall see later) given to the fifth finger's distance from the latter two. The appearance of the pseudo-zygodactylous gesture can also occur naturally in society without a symbolic reference while the hand is at rest, or in art as a conscious or unconscious foreshortening or lessening of the fingers' normal spread.41 Naturally occurring p/z gestures are innately the result of an individual's particular muscular development in the hand, caused by the normal tension of the adducting interosseous muscles of the fourth finger which draw it inwards toward the third, middle finger.42 Examples of this arbitrary form of pseudo-zygodactylism are not uncommon43 but do not relate to the topic here. The first two paintings were created before El Greco was born in 1541, one by a Dutch painter and one by a Spaniard from Toledo. Five of the six depict explicitly religious scenes and all of these five have some proximal relation to a woman's breast. Of these five, all offer an overt, almost blatant display of the woman's breast: four in which the woman is pressing or touching her breast with the pseudo-zygodactylous gesture, four in which the woman is holding her exposed breast for nursing (lactation), four in which the Virgin Mary is an active primary or secondary figure, one in which Juno is the primary figure, and one in which a male saint uses the p/z gesture on his chest as he receives Mary's breast-milk. Only one of these six paintings--all of which use the pseudo-zygodactylous gesture--that of the caballero, has no action, no woman, no breast, no milk, and nobody else in the picture. (d)	number of individuals involved in the encounter. indirect contact between goddess and a holy adult human male (saint) as a blessing, as symbolic adoption, and as an affirmation of the male's sanctity (spiritual dyad). pseudo-zygodactylous gesture, no lactation, no direct or indirect physical contact, and usually no other person present. To test this hypothesis we shall examine relevant material relating to the physical and metaphysical aspects of breast-feeding, breast-milk, and breasts in both secular and religious literature and art. 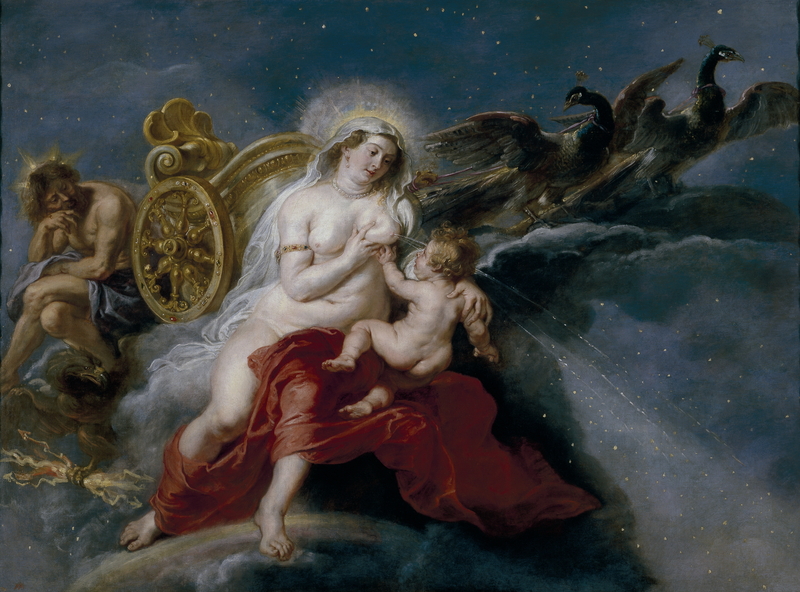 Images of lactation, the breast, and the pseudo-zygodactylous gesture in general will be examined for the manner of use of the p/z gesture and then juxtaposed alongside the subdivisions given above in order to determine whether, and if so, how, there is a corresponding relationship between the pseudo-zygodactylous gesture, lactation, and metaphysical life. As demonstrated in the Prado sampling above, the p/z gesture may also be found in paintings commonly regarded as "mythological" as opposed to "religious." This distinction is made to separate the socially-accepted religious myth, called "religion," from the old, rejected religious myths of time gone by. The purpose of this paper is to examine the historical spectrum of religion for information relating the pseudo-zygodactylous gesture to breast-feeding and, as such, will attempt to maintain a respect to all cultures reviewed, regarding all religious literature and belief equally as myth. Thus the current cultural distinctions between Christian "saint" and the pagan "demigod," as well as between pagan "goddess" and Christian "mother of God" will not be respected in this essay when needed for comparison. This will necessitate referring to both Juno and the Virgin Mary alike as goddesses, and to Jesus and Hercules as gods. The acronyms "bce" and "ce," "before the common era" and "common era" respectively, will be used to symbolically provide an impartial description of events, still according to Western dating, in an attempt to define time apart from First World Christianity.